Cantor in 4.6 is gonna rock! The last release of Cantor didn’t have many new things to show off. I was busy with university so it mostly just got minor bug fixes. But for the next release you can expect a great amount of additional awesomeness. And the best thing? I didn’t have to code any of it! All the cool new features were written by new faces. Cantor now has the ability to insert Text cells into the worksheet, so you can comment your calculations or just do some pretty headlines. You can insert a great deal of RichText so if you want you can go completely nuts designing your new worksheets! This one was written by Raffaele. 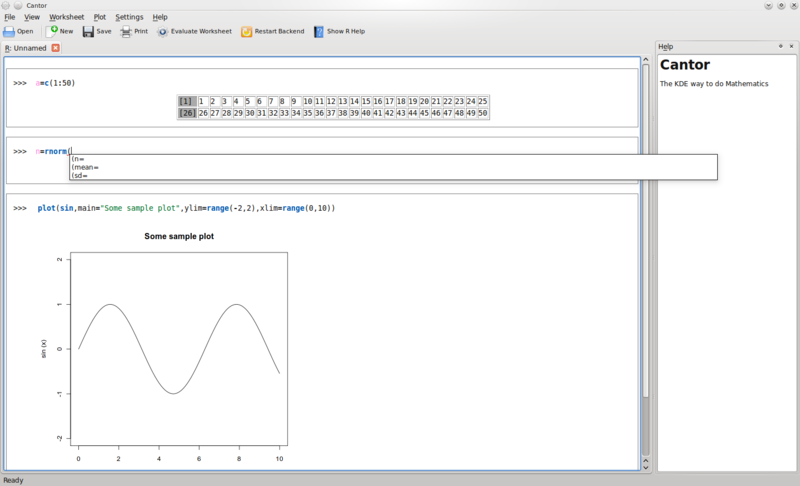 Octave is one of the leading packages for numerical mathematics and a great replacement for the proprietary MATLAB. 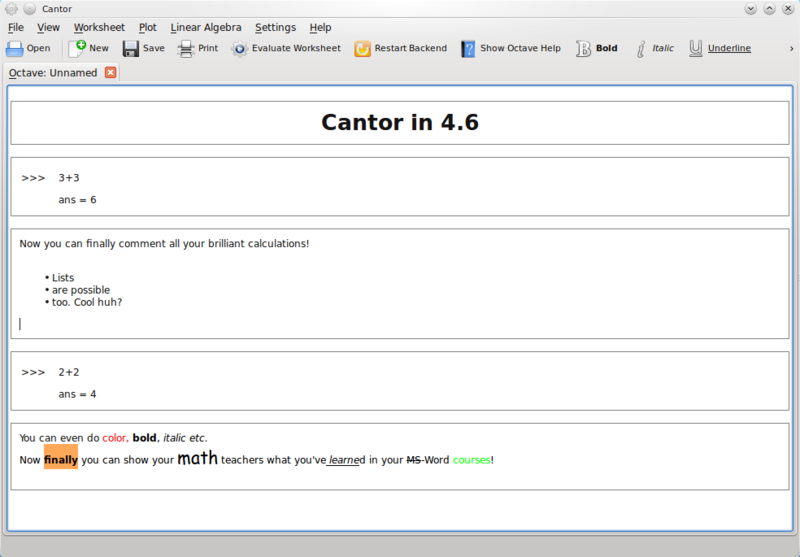 Thanks to Miha and his Season of KDE project you now have the possibility to use it from within the beautiful Cantor Worksheet interface (isn’t that just cool?). It is already full featured with Syntax Highlighting, inline plots, Tab completion etc. The R backend has always been the lost son under all the backends. I never used it that much so it never got to shine. This summer during his Google Summer of Code project Oleksiy decided to give this backend the love it deserves. Now this backend finally has all the features you missed when comparing it to the others (e.g Tab Completion or Syntax Highlighting). But it also gained some R unique features, for example up to now you only saw the normal output, you’d also have gotten when using the command line. That means boring Ascii-Art like tables. But not anymore, nowadays you get pretty tables integrated in the worksheet! Those are only the most visible improvements. There are also quite a lot of under the hood changes going on at the moment, that will make Cantor faster, more flexible and overall a greater place to hack on. Those are some really exciting times for Cantor. It’s developement team has basically grown three times the size it had last year (that was basically just me 🙂 ). So prepare for all the new glory that will be Cantor when 4.6 will be finally out next year. (And be excited for what new stuff we might come up with until then). (*) The new R backend is not yet in trunk. It resides at /branches/work/cantor-soc/ but it will be merged soon. This entry was posted on Wednesday, August 18th, 2010 at 00:50 and is filed under Uncategorized. You can follow any responses to this entry through the RSS 2.0 feed. You can leave a response, or trackback from your own site. 5 Responses to Cantor in 4.6 is gonna rock! Awesome to see Cantor kicking though, rock on! 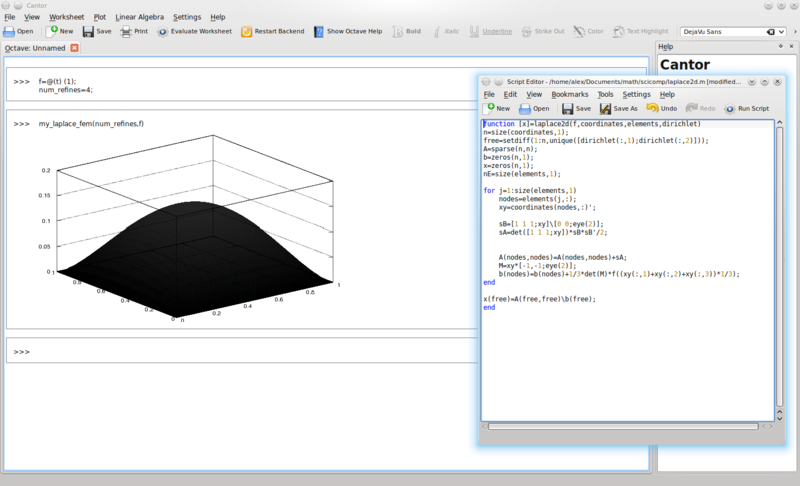 I love this software, it should be the default frontend for all those mathtematical software!